Last year I saw British band Peggy Sue at Bottom of the Hill. As happens from time to time, I found myself utterly charmed by the opening act: their eclectic chamber pop, animated performance, and the frontman’s cat-adorned grandpa sweater. That band was Pepper Rabbit. I’ve since learned that lead singer, Xander Singh, has a collection of fabulous sweaters, and Pepper Rabbit has an equally fabulous collection of orchestral pop songs. 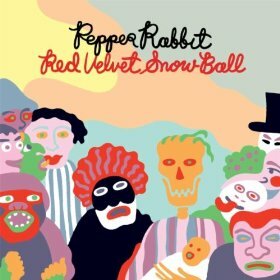 If debut album Beauregard was a lush, mature introduction to the LA band, sophomore effort Red Velvet Snow Ball is a more focused development of those same sounds. The duo hasn’t lost the whimsical tendencies that made Beauregard so enjoyable, but they’ve found ways to streamline them: tighter layers, strong vocals, expertly mixed instrumentation. There’s a reason Kanine Records called it Pepper Rabbit’s “most collaborative work yet”. Red Velvet Snow Ball is balanced and cohesive, clearly a joint effort between Singh and percussionist, Luc Laurent. Vocals and instruments no longer vie for our attention, as was the case on many of Beauregard’s atmospheric tracks. Instead, they sit confidently side-by-side – even on percussive single, “Rose Mary Stretch” or jangly ode, “Allison”. The result is both powerful and captivating.